Futuristic thriller ‘The Fearless’ has been chosen as the 2016 winner of South Gloucestershire’s young people’s literature prize the Concorde Book Award. The debut novel by Derbyshire author Emma Pass beat off competition from five other young people’s fiction titles to claim the coveted award. 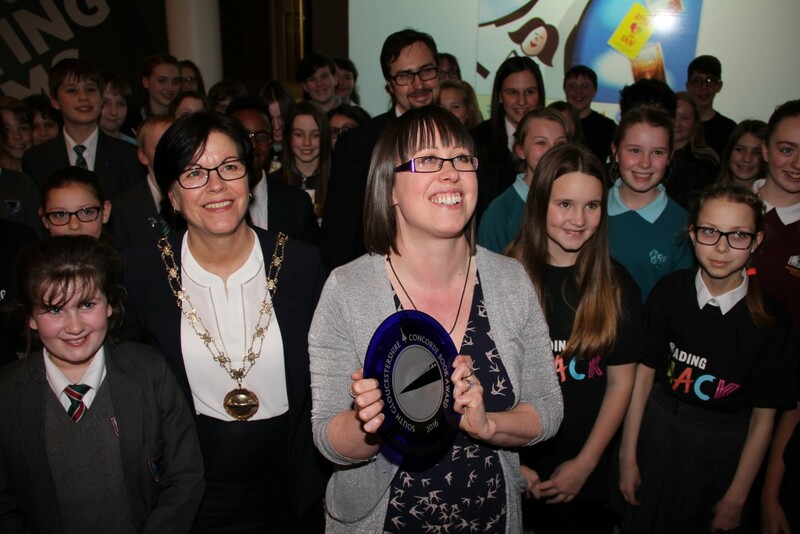 Once again this year’s winner was chosen after an exciting district-wide reading challenge in which hundreds of young people from public and school library reading groups throughout South Gloucestershire worked their way through a shortlist of titles. Votes were cast on World Book Day and the winner was announced last night at a gala event at the Bristol and Bath Science Park in Emersons Green. Receiving the award, Emma Pass said: “Thank you so much. I’m absolutely shocked – I was not expecting it at all. Winning these awards means so much because it’s the readers that pick the winning author. Chair of South Gloucestershire Council Cllr Erica Williams said: “It was a pleasure to attend the award ceremony and I was really impressed by the enthusiasm of everyone taking part. ‘Wild Boy’ author Rob Lloyd Jones and bestselling World Book Day author Cavan Scott also attended and spoke at the event. The Concorde Book Award, supported by The Bristol Post, is a long-running ‘young people’s Booker’ run by South Gloucestershire schools and public libraries in which groups of young people read a shortlist of novels before voting on their favourite title. The scheme aims to promote a love of reading among 11-13 year olds and since it was launched in 2007, thousands of young people have taken part. The Award is unique in being one of the few literary awards chosen by young people rather than adults. Shortlisted books are made available from South Gloucestershire public and school libraries, and voting takes place on World Book Day in March each year. This year’s shortlisted titles were ‘Apple and Rain’ by Sarah Crossan, ‘Terror Kid’ by Benjamin Zephaniah, ‘She is not Invisible’ by Marcus Sedgwick, ‘The Fearless’ by Emma Pass, ‘Wild Boy’ by Rob Lloyd Jones, and ‘Would the real Stanley Carrot please stand up?’ by Rob Stevens. Cllr Williams, winner Emma Pass and some of the young people who took part.